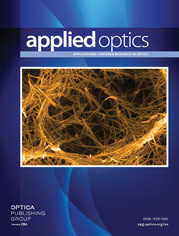 The authors are with the Royal College of Advanced Technology, Salford 5, England. It is shown that the performance of metal–dielectric interference filters of the Fabry–Perot and Spacerless Induced Transmission types in parallel radiation incident obliquely can be described in terms of that of a single equivalent dielectric layer of refractive index μE. Expressions for μE are deduced in terms of the optical constants of the layer materials, and their validity is established by the satisfactory agreement that is shown to exist between experimental and calculated values of μE. a The layer in the quarter-wave system adjacent to the matching layer has optical thickness 3λ0/4. Modification of the appropriate expression in Table II is necessary to take this into account. μL (Cryolite) = 1.34, μH (ZnS) = 2.218 + (4.52 × 106)/λ2 (Ref. 8), k(Ag) = 3.41 + 8.7 × 10−4 (λ − 5460) (Refs. 5 and 9).